Publishing, Reflecting, and a little Party! After we finished two Interpretive Essays I was trying to find a way to celebrate student accomplishment. Students worked so hard through mini-lesson after mini-lesson. They were so great about going back and adjusting, adding, cutting, and modifying their writing pieces. I got to thinking to myself: How would I feel if I wrote something, then continued to be taught things and have to go back and make all of these changes. I think after a while it would get to me, I would just want to be done! So to celebrate students shared their written pieces, but then grabbed a laptop (from our shared carts) and showed their writing partners their character Voki avatar they created. They had embeded this on their blog along wtih their writing. It was a great way to integrate technology into the writing celebration process. After watching and listening to their discussions on their writing I felt like I wanted to hear more from them as to how they feel they were growing as writers. This unit was a challenge for many and they struggled to get through their pieces. 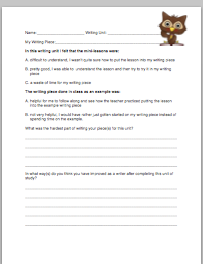 I developed this reflection questionairre to give to students at the end of a Writer’s Workshop unit. It will be different from a self-grading rubric that I use, more of a metacognitive approach for them to be aware of their growth throughout the process of publishing their piece. I have found and read research that shows when students can be reflective of their learning they open up the opportunities within them to be able to identify new strategies, then learn and implement them on their own in future pieces.